On paper, it sounds so simple: a room that demands only a well-lit desk and a comfortable chair. But the study of our dreams does more than provide a surface for writing and lamps for reading: it offers a whole-hearted affirmation of its owner’s deepest core. Its purpose may be wide ranging-from full-scale research projects to a surreptitious cigarette snatched over a glass of whisky as you catch up on the racing results on iPlayer. as the gunrooms and boudoirs of a vanished generation. Whoever its owner, it should inspire possessiveness, as much a part of one as a favourite rain hat and those photographs of deceased pets whose value no one else can guess. A study is an intimate space, regardless of its size. To the outside world, it may resemble a full-scale library, but it contains within itself corners and recesses perfectly condu-cive to contemplation or catnapping. Even airy, modern studies, where a laptop, iPhone and printer alone disturb the streamlined surfaces, encode an idea of privacy, as if the visitor has stumbled on his host’s ablutions. But this isn’t a selfish room: the dogbed beside the bookcase is proof of shared ownership. 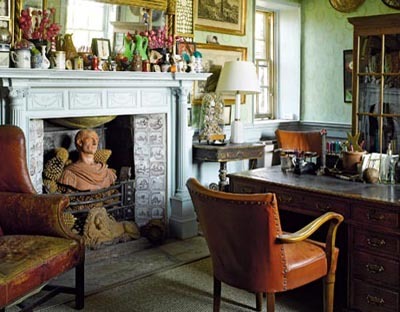 It’s an enclave of books and busts and silver-mounted blotters and bottles all jumbled on to a butler’s tray the household’s lesser drinks table. Its surfaces sport photographs in frames and piles of magazines. On the floor, a Ziegler carpet too worn for use elsewhere contributes all the colours of old Persia. Its labyrinthine pattern and a suggestion of exotic hi-jinks lifted straight from the novels of Agatha Christie may be as near to adventure as the room’s owner ever ventures. Whether the room is on the ground or first floor, there will be a view over the garden or the street beyond, a visual reminder that all work and no play makes Jack a dull boy. The perfect study is neither stereo-typically masculine nor feminine in appearance: it simply reiterates something of its owner’s character. It may double as a cosy sitting room home to television, an iPod docking system, a cupboard full of games; as such it requires comfortable sofas and chairs, well-lined curtains or working shutters, small tables and lamps. Alternatively, it’s a home office, and its furniture, be it a Louis XV bureau plat or a Conran trestle table, peaceably coexists with current technology and all the paraphernalia of modern communications and networking. Only the room’s smell tells you that this is not a commercial space-the tang of new leaves in the garden outside, a tower of newspapers awaiting recycling, old pot pourri or the owner’s scent applied day after day, year in year out, infiltrating curtains, cushions, even the very pages of the books that crowd the shelves. In houses with a young family, children’s artwork may overspill the kitchen into the study. Perhaps the carpet betrays past accidents of small children or new puppies. Intimations of life lived, like the impress of a body in a cushion, define this room. When the door is closed, the study shrinks to a table, a chair and a light source. The chair combines comfort with proper support, the table is generously sized and of the right height, the light source is practical but beautiful, whether an antique toleware bouillotte wired for electricity or the lifesize Horse floor lamp designed by Front for Moooi. It illuminates work in progress with-out emphasising the siren allure of those piles of waiting books or last year’s damson vodka still unopened on the drinks tray.